WebPortal brings the power of SalesPad online. Take advantage of all the benefits an online store can bring to your organization with the SalesPad WebPortal. Customers can make purchases, employees can put in requests for additional inventory to be delivered to their location, and your company can do more business. Learn more about WebPortal and how it can help you take advantage of all the benefits an online store can bring your organization. 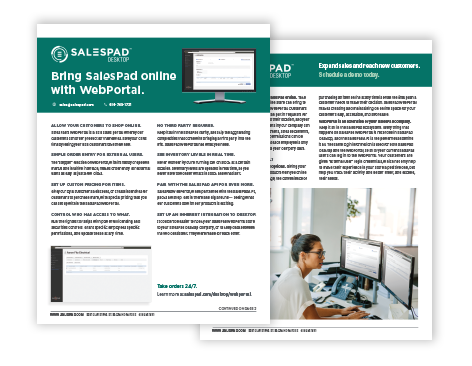 Download the fact sheet to learn how you can bring SalesPad online with WebPortal. Get your copy of the fact sheet now and see how WebPortal can help your business.